Follicular Unit Extraction (FUE) is an advanced surgical procedure that trained hair loss surgical teams are performing in Cincinnati with Dr. Mendelsohn. This minimally invasive hair restoration procedure is being performed on patients who are suffering from hair loss. What is Smart Graft Advanced F.U.E.? Smart Graft Advanced F.U.E. is an innovative device designed to enhance the physician and his teams speed and efficiency by increasing graft viability while reducing transection rates. The device also counts and separates the grafts by the number of follicles, and protects them in a sterile controlled environment until they are ready to be implanted. What’s the Smart Graft Advanced F.U.E. procedure like? The surgical team using the Smart Graft Advanced F.U.E. hand piece, gently extracts individual micro hair grafts from the back of your head. The grafts are immediately collected, counted, sorted and held in a sterile controlled environment. 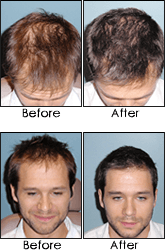 These grafts are then implanted into the balding area to regrow thick, healthy, natural hair. There are several older technologies currently available to hair restoration surgeons including automated devices and robots however, they are still fundamentally slow. The Smart Graft Advanced F.U.E. technology is designed to provide better visualization for the physician, extract, sort and count the grafts automatically and eliminate a lot of the time consuming physical manipulation of the instrumentation and the grafts themselves. This revolutionary new technology can reduce harvesting time by 1/3rd of the other existing technologies. The time savings allows the surgical team to perform larger cases in less time. The follicles can be re-implanted sooner which increases the viability the new grafts. New hair grafts will grow in the areas that are bald or thinning, in accordance to a well thought out strategic plan, creating a fuller, natural looking head of hair. Since it’s your real hair, it looks completely natural, restoring a more youthful appearance and confidence levels.Do I have to shave my head to have a Smart Graft Advanced F.U.E. procedure? Do I have to shave my head to have a Smart Graft Advanced F.U.E. procedure? No. If your hair is long enough, a physician and his surgical team can harvest hair grafts using the Smart Graft Advanced F.U.E. by shaving small areas that can be covered by your longer hair. No. It’s an in-office, outpatient procedure that does not require heavy duty anesthesia. The surgeon will use a local anesthetic to numb the area he/she is working. Most of the time you can watch tv or listen to music while the procedure is going on. The healing time is reduced to half when compared to the strip method. Typically patients start seeing new regrowth at about 3 to 4 months and full maturity at month 12. This is the main benefit of the Advanced F.U.E. procedure. Since the grafts are removed in individual micro grafts rather than a large strip requiring stitches, scarring is minimal and is not visible. Even if you wear your hair short, there is no visible linear scar associated with older traditional methods. Is Smart Graft Advanced F.U.E. available for both men and women? As long as the cause of the hair loss is genetic in nature, both men and woman can benefit from Smart Graft Advanced F.U.E. in Cincinnati. Am I a good candidate for a procedure using Smart Graft Advanced F.U.E.? The majority of hair loss patients are candidates for the Smart Graft Advanced F.U.E. procedure, namely those who would like to wear very short haircuts and want the least amount of activity restrictions after their procedure, Dr. Mendelsohn and his team consult with patients on a weekly basis about the Smart Graft Advanced F.U.E. technology to find out more.